Prominent Iraqi Shiite cleric Muqtada al-Sadr’s weekend visit to Saudi Arabia has raised concerns in Tehran. While the Iranian government and media outlets affiliated with the Islamic Revolution Guards Corps (I.R.G.C.) largely refrained from commenting on Sadr’s trip and his meeting with Saudi Arabia’s Crown Prince Mohammad bin Salman, some conservative newspapers and Iranian analysts cautioned that the Saudi government is attempting to court Iraqi Shiite leaders to influence Iraqi politics at the expense of Iran's interests. “Is the headline-making Iraqi cleric leaning toward Saudi Arabia?” asked Fararu, an outlet affiliated with conservative politician and mayor of Tehran, Mohammad Bagher Ghalibaf. The article wrote that Sadr’s trip to Saudi Arabia was “unexpected” and “even shocking” although the Iraqi cleric is famous for shifting alliances to remain powerful and influential. It listed Sadr’s shifting political positions in the past, including stopping militant activity against the United States, turning against the ruling governments in Baghdad, and most recently, calling on Syrian President Bashar al-Assad to step down. Sabah Zangeneh, an Iranian analyst of Arab affairs, echoed a similar view. “At present, Muqtada al-Sadr cannot be considered an effective individual. He is under influence now. Saudi Arabia wants to control him in some ways and it is therefore a matter of concern,” he cautioned. “And it is important to monitor what he will do after his trip and in the run up to the parliamentary elections in Iraq,” Zangeneh added, warning that Riyadh might “use Sadr as a pressuring tool against the Iraqi government, or even against Iran.” He, however, emphasized that if Sadr has decided to join hands with Riyadh, he will face resistance from his “diverse” followers. Zangeneh also speculated that Sadr may have gone to Saudi Arabia to seek financial help from Riyadh to prepare for the upcoming Iraqi parliamentary elections. With Ammar al-Hakim exiting the Supreme Council for Islamic Revolution in Iraq and creating the National Wisdom Party, a "new political wave is on its way in this country,” he noted. “Perhaps, Sadr is also attempting to initiate a new front.” He added that Sadr has maintained close ties with leaders of other Sunni Gulf states and had traveled to Riyadh 11 years ago as well. Hamshahri Online also cautioned that Saudi Arabia is attempting to influence Iraqi politics. It noted that Sadr has for years remained close to Sunni Gulf states, and that Sadr remained silent about the Qatari crisis. Javan Online, which is an I.R.G.C. mouthpiece, said Riyadh’s invitation to Sadr is the latest indication that Saudi leaders have adopted a new approach in dealing with Baghdad – highlighting that several top Iraqi and Saudi officials have traveled to each other’s country in recent months. State-run al-Alam New Network, however, opined that the Saudi government’s invitation to Sadr is part of a broader effort by the Kingdom to influence Iraqi Shiite parties and seek their support to calm Shiite unrest in the Kingdom’s oil-rich eastern region. According to one Iranian outlet, the Saudi govenrment has also extended invitations to other Iraqi Shiite leaders, who have not yet decided whether to visit the Kingdom. Some Iranian outlets suggested that the new Saudi crown prince aims to enhance his image among the Kingdom’s Shiite minority by inviting Iraqi Shiite leaders to the country. Saudi Arabia’s eastern region has seen sporadic antigovernment violence since the beginning of the Arab Spring six years ago. Muqtada al-Sadr is a member of an influential Shiite family and a son of prominent Shiite cleric, the late Grand Ayatollah Mohammad Sadeq al-Sadr. While Sadr has lost some of his political clout recently, he still has a large support base among the Iraqi Shiites as the leader of the al-Sadr movement. It is therefore not surprising that his visit to Saudi Arabia and his meeting with the Saudi crown prince and other senior officials have caused a stir in Tehran. 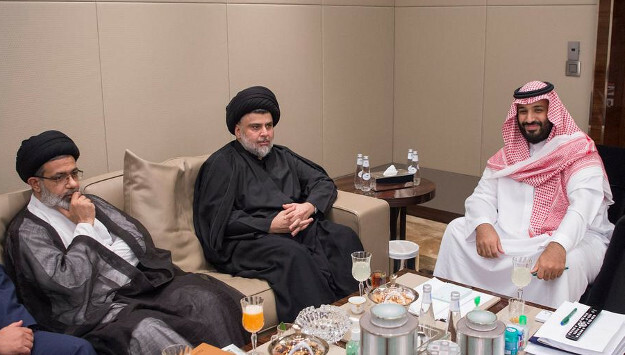 While details of Sadr’s latest trip to Saudi Arabia have not been released, an official statement from Sadr’s office said the visit was aimed at improving ties between the two neighbors and defuse sectarian strife in the Arab-Islamic world.